The Chilcot report that enquired into Britain’s decision to join US coalition that attacked Iraq which was released today finds that Britain decided to join the 2003 invasion of Iraq based on “flawed intelligence”. John Chilcot, the chair of the Iraq Inquiry said that the invasion went “badly wrong”. The 2.6 million-word Iraq Inquiry – which took seven years to prepare – was published in full on Wednesday. It can be accessed online. “The UK chose to join the invasion of Iraq before the peaceful options for disarmament had been exhausted.” Chilcot said that, despite explicit warnings, the consequences of the invasion were underestimated. 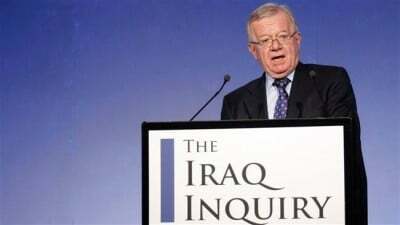 Investigators also found the planning and preparations for Iraq after Hussein was overthrown were wholly inadequate, said Chilcot, who had not been asked to rule on the legality of the invasion. “The people of Iraq have suffered greatly,” Chilcot said. Responding to the report, former Prime Minister Tony Blair said in a press conference on Wednesday that he “accept full responsibility without exception and without excuse” for the decision to go to war in Iraq, but insisted that the world “is in a better place without Saddam Hussein”. the decision to go to war in Iraq and remove Saddam Hussein from power in a coalition of over 40 countries led by the USA, was the hardest, most momentous, most agonising decision I took in 10 years as British prime minister. For that decision today I accept full responsibility, without exception and without excuse. I recognise the division felt by many in our country over the war and in particular I feel deeply and sincerely – in a way that no words can properly convey – the grief and suffering of those who lost ones they loved in Iraq, whether the members of our armed forces, the armed forces of other nations, or Iraqis. The intelligence assessments made at the time of going to war turned out to be wrong. The aftermath turned out to be more hostile, protracted and bloody than ever we imagined. The coalition planned for one set of ground facts and encountered another, and a nation whose people we wanted to set free and secure from the evil of Saddam, became instead victim to sectarian terrorism. For all of this I express more sorrow, regret and apology than you may ever know or can believe..
Sir John Chilcot’s inquiry has not, in his words, “expressed a view on whether military action [in Iraq] was legal”. That question, he said, could be resolved only by a court. Still less does his report deal with the question of whether Tony Blair or others should face legal action.